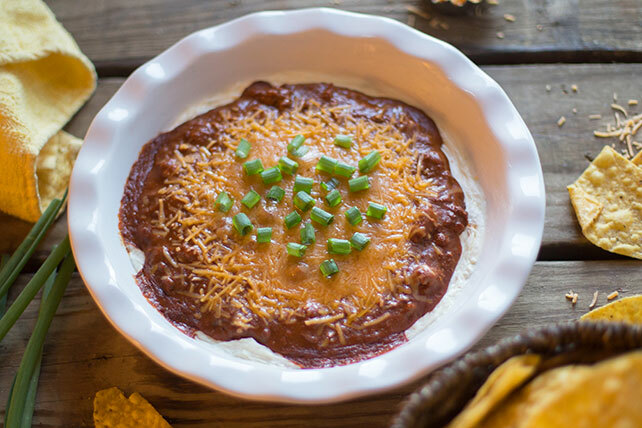 Omit chili and cheddar. Top cream cheese with 1/2 cup chopped cooked chicken tossed with 1/2 cup Buffalo wing sauce. Top with 1/4 cup blue cheese crumbles. Microwave as directed. Sprinkle with onions. Place unwrapped block of cream cheese on microwaveable plate; top with chili and cheddar. Then, microwave and garnish with onions before serving as directed. Prepare using your favorite variety of canned chili - with or without beans, regular or spicy.